Every picture tells a story. Or does it? Where is the pain on this picture? On any picture? When it comes to pain and injury, the two are frequently thought of as synonymous. There is the well trodden path of reporting pain resulting in a scan or x-ray resulting in a finger pointing at an area on the picture as the culprit resulting in some pills, an injection or perhaps even surgery. We must qualify the importance of eliminating serious pathology or tissue damage requiring intervention. Once this has been done, and in the vast majority of cases of chronic pain there are no serious findings, the focus must be on getting better. However, the truth about pain and pictures is rather different. Yes, you may be able to see on an image an area of ‘wear and tear’, a disc bulge, a disc herniation, signs of osteoarthritis, or other visible changes. You cannot, however, see pain. So when pointing to one of these ‘structures’, how can you say that this is the cause of pain. How do you really know? 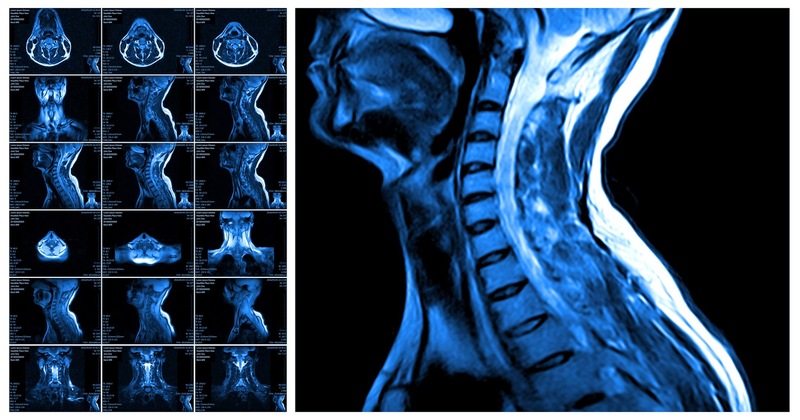 Consider a recent paper, ‘Systematic literature review of imaging features of spinal degeneration in asymptomatic populations’ (2015) that concluded: ‘Imaging findings of spine degeneration are present in high proportions of asymptomatic individuals, increasing with age. Many imaging-based degenerative features are likely part of normal ageing and unassociated with pain. These imaging findings must be interpreted in the context of the patient’s clinical condition’. Further, Herzog et al. (2017) considered the experience of a person being scanned at 10 different centres over 3 weeks. They found a ‘marked variability in the reported interpretive findings and a high prevalence of interpretive errors in radiologists’ reports of an MRI examination of the lumbar spine performed on the same patient at 10 different MRI centres over a short time period’, concluding, ‘that where a patient obtains his or her MRI examination and which radiologist interprets the examination may have a direct impact on radiological diagnosis, subsequent choice of treatment, and clinical outcome’. The poor relationship between pain and injury has been a known fact for many years. Pat Wall stated this as far back as 1979, with a huge number of studies and observations in the wake of this since. This poses the burning question, why does healthcare and society continue to ignore this fact and continue to concentrate upon a senseless search for a structure to explain pain? Followed by the question of why people are so often offered drugs and interventions as the way forward instead of understanding their and learning about how to overcome pain and live a life. Whilst drugs and interventions can have a role, they do not teach us how to live. Sustained change takes understanding and the practice of healthy skills. Brain scan studies have given us incredible insight into the activity of this magnificent organ. It is like porridge. There are areas that show themselves to be ‘working’ during the experience of pain, and this has generated much excitement. Perhaps these are the ‘pain areas’, some people thought. Unfortunately not. There are no pain areas, and for that matter, there are no pain signals or pain nerves. Instead we have systems that play a role in our survival and protection including the nervous system, immune system and autonomic nervous system. There are two important points here that we must consider. Firstly, we are more than a brain, much more. I am a whole person, embodying my thoughts, feelings, intentions, perceptions and actions. Secondly, as with MRI scans, we cannot point to an area and say that it is pain. We simply do not know how measurable and observed physiological activity becomes a lived experience. A question posed in an excellent paper by Krakauer et al. (2016) is this, ‘how does the brain lead to behaviour?’. Whilst the article is not about pain per se, they state ‘neural circuits do not feel pain, whole organisms do’. This thinking is very much in line with the very modern approach to pain: whole person. The bottom line is that pain is subjective, only ever to be experienced by the person who’s pain it is, and never to be seen. A disc is a disc, not pain. A joint is a joint, not pain. A swelling is a swelling, not pain, etc. These observable features are objective and hence by definition not the same. It is essential that society and healthcare shift away from the predominant and existing thinking, and take on the facts of pain as we have known them for over 30 years. Pain is a body, or whole person state. Pain is about protection when a threat or a danger is perceived, consciously or unconsciously. If the weight of evidence suggests danger, it makes sense that we should shift into a protect state. However, in chronic pain this state emerges because there is a frequent interpretation of possible danger. On the basis that we work on a ‘just in case’ basis, there might be a threat, so a protect state comes forth as the primary state just in case. You may argue the point that if there is nothing ‘wrong’, and that there is no damage, why should it continue to hurt? In short, this is because the interpretation based on what has happened before (priors) maintains a level of existing threat. You could ally this to habits and habitual responses based on what has happened before and expectations of what is likely to happen, again based on priors. More on this in a subsequent blog. For now, to simply say again, pictures do not show pain. Next Article What training do I do? Need to think of the nervous system as a highly complex electronic system which interacts in complex ways with muscles, with the inflammatory system and with the immune system…. It is no wonder really that we have such problems in dealing with complex pain!